We have officially completed one whole month of 2010! I hope you all have been having a great 2010 so far. Have you all been living up to your New Years resolution to eat right and exercise? I know we all have a hectic schedule, but with a little planning (making your meals in advance) this can be done. People, its only been a month, do you really think it would be fair to yourself to give up already? I didn’t think so! Your health is at your own mercy, only you can control how you treat it and yourself. One thing to remember, eat a healthy breakfast like a king, a humble lunch like a prince, and a light dinner like a pauper. I especially make sure I eat a light dinner if I’m eating really late. 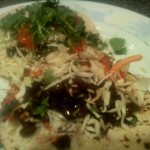 In fact, just last night, I came home late and still had a filling and yet light meal of vegetarian tacos. I hope you enjoy this recipe! 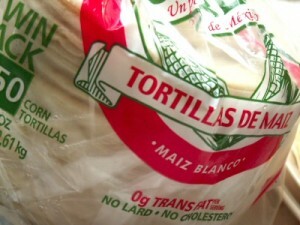 Toast the corn tortilla’s on an open flame, on your stove. Once toasted add each ingredient to build your tacos. BTW – Make this a prince like meal by adding chopped chicken or fish! This entry was posted on Wednesday, February 3rd, 2010 at 12:19 pm and is filed under Uncategorized. This looks yummy! I love veggie tacos and fajitas – I do something similar but I use red/orange bell peppers, onions, black beans or red kidney beans, salsa, tofu cheese and whole grain wraps. eggplant would be good too! cheers!